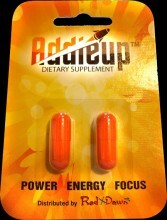 AddieUP™ is an herbal dietary supplement that promotes energy, focus and concentration. The four stimulants in AddieUP’s formulation combine synergistically to produce a powerful tool which allows you to perform your best. A breakdown of these essentials illustrates the important function they serve as part of AddieUP’s proprietary formulation. AddieUP’s ingredients come from the highest quality suppliers, with emphasis on natural and safe formulations that meet our strict quality guidelines. AddieUP is the result of of diligent research and experience. Our proprietary formula contains the following ingredients. These important ingredients when combined in the correct amounts can help to provide a profound impact in quality of life and work. Scientific research shows Yerba Mate to be a powerful antioxidant that can protect DNA strands from a problem known as double-strand breaks. The key benefits of Yerba Mate include increased mental clarity, focus, alertness as well as mood elevation. With 24 vitamins and minerals, 15 amino acids, 11 polyphenols, Yerba Mate is one of nature’s most balanced stimulants. 2. Guarana - Guarana comes from the berries of Paullinia cupana, a plant native to the Amazon basin in Brazil. Guarana contains thobromide and theophylline, as well as the natural phenols catechin and epicatechin. This powerful plant has been used by the Amazon Indian Tribes for centuries to gain increased energy, brain power, and endurance. These antioxidants give the brain and body protection from harmful free radicals and provide a powerful endurance boast. In a 2007 pilot study, memory, alertness and mood levels were all increased by low doses of guarana extract. In our AddieUP formula they assist in helping to provide cognitive improvement. We source only the highest quality Guarana extracts. 3. Caffeine Anhydrous – Caffeine Anhydrous is a psychoactive stimulant known chemically as trimethylxanthine. Caffeine Anhydrous belongs to a group of stimulants called xanthenes which occur naturally in certain plants. Xanthenes stimulate the central nervous system to combat drowsiness and restores alertness. Caffeine is the world’s most popular psychoactive substance, with nearly 90 percent of adults in North America consuming it on a daily basis. 4. 1,3 Dimethylamylamine Found in geramium oil, this gentle stimulant is known to help with focus and energy, and completes our four stimulant formulation. Our formula didn’t stop with only stimulants, however. Combining these 4 stimulants with Nootropics is one of the keys to our fomulation being so effective.